I have a close friend I often refer to as my part-time man. We’ve been close for many years but live in different cities, keep our own schedules and feel no obligation to show up for one another’s important events. We are not, after all, husband and wife, or even “partners.” Indeed, I am a single, independent woman. Which brings me to Melania. Melania seems almost as single and independent as me. (You go, Girl!) Watching her – and the Donald – it is clear Melania isn’t a fulltime first lady. She is not present all the time or “on” for the American people – or her husband. Melania is part-time. Clearly, Melania got off to a slow start as first lady. She stayed in New York for months after the Donald took office. Rumor has it she cried when he won. Ever since arriving in DC, her public appearances have been sporadic. Until recently, it had been nearly a month since Melania had been seen in public. Apparently, she’s been having some liver problems. Sure. We understand. And of course, who can find fault with her #BeBest campaign (although the wording could have been better). I mean who likes cyber bulling? But, overall, Melania’s heart really isn’t into this first lady thing, is it? She seems to prefer chillin’ at Mar-a-Lago. Going down when she feels like it. Melania attends important events such as her husband’s State of Union address separately, like she’s single – like me. She often denies her husband the right to hold her hand in public (probably pretty emasculating for the Donald…). My friend and I don’t hold hands either – because it’s not like that. And, now we hear Melania doesn’t plan on attending the upcoming G-7 event. Is that optional? I mean – I thought married women – and especially the first lady – had to do these kind of things. I mean I could understand if Melania was a Supreme Court Justice, a general surgeon or rocket scientist and her schedule just wouldn’t allow for that kind of travel. But, she’s not. Which brings me to another thing: Melania gets all her fancy housing and clothing paid for. 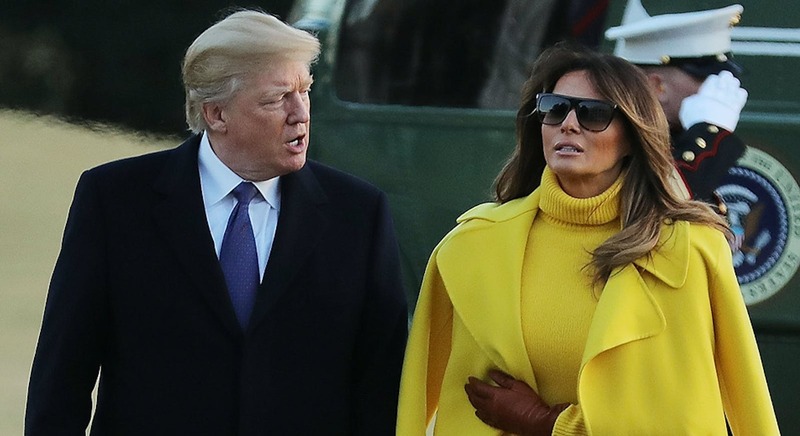 We know she’s got some sort of product line going on, but it seems like it takes a lot more money than what comes in from that side gig to keep Melania living in the style she does. This is where Melania and I are very different. I definitely work for everything I have. Everything you see – and some might argue it’s a lot – I worked for. No man bought me anything I have. (Ok, I do drive my father’s old Benz…) But, you get my point. Simply put: Melania leads a mostly separate, independent life from the President. Her lifestyle is more like a kept woman than a married one, let alone a first lady. And, ladies, we all know if Michelle or Hillary (who also had a cheating husband) pulled something like this – not showing up to important events, not allowing their husbands to show them gentle affection in public – we wouldn’t hear the end of it from the Right. And, because those on the Left don’t want to appear “judgmental” or not allowing the First Spouse to be his or her own person, they don’t say anything. And, therefore Melania – and Donald – get away with this. But, don’t the American people deserve better? Maybe we want to be a little more “traditional” and retro here and demand that our First Lady show up at events with the President and enter as a couple. I mean… shoot, maybe she should step aside and let another lady get up there and be First Lady fulltime. Is this the new model for America’s First Lady? A person who’s not really into being the president’s partner but more into living their own life on their own terms? Very radical and progressive – perhaps. But, does Melania’s model provide the leadership we need in “coupledom,” American love and family values? The first couple seems as divided as the nation – not exactly a soothing balm in these trying times. Obviously, the Donald is having as hard of a time unifying his marriage as he is in unifying the country. Showing love to either hasn’t been his forte. I know I’m digressing here. Ladies, don’t mistake independence for not doing your job – fulltime.